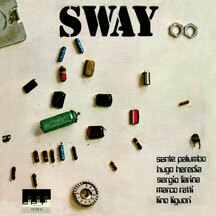 Led by pianist Sante Palumbo, Sway is an excellent album heavily influenced by early 70s Miles Davis, even without the presence of trumpet. SKU: OK8. Category: CD-Distribution. Tag: Sway. Throughout, the album features wah wah guitar rhythms and tribal drumming. The first side is a bit looser, with some shrieky sax, drum solos and some piano noise bits. But Side 2 contains ‘Mad’ which is absolutely sublime. The sax is traded in for flute, there’s an actual melody line carried throughout, and the guitar fuzzes out some wonderful solos. Mini LP japanese style papersleeve packaging, with custom OBI .